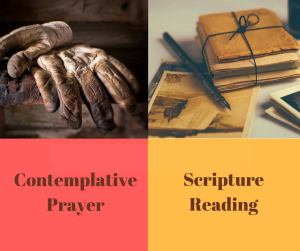 This year we are focusing on two (2) Lenten practices: Contemplative Prayer and Reading the Gospels in 40 Days. Instructional pamphlets are available outside the church office or download a copy using the links below. You can maintain either practice on your own or join a group at the church for more accountability. On Sunday morning during the six weeks of Lent, these groups will provide an opportunity for you to share your experiences weekly with others who have chosen the same practice. Contemplative prayer will meet in the blue room upstairs. Scripture Reading will meet in the yellow room upstairs. Both groups meet during the Sunday School hour, starting at 9:45 a.m. If you have questions call the church office at 774-6453. Click a link below to download your copy of instructions.